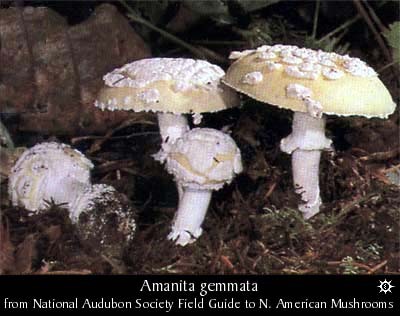 A. gemmata is creamy to plae yellow, golden-yellow, or buff, often slightly darker at the center. Its Cap is 4-10 cm (2-4") in diameter, broad, rounded becoming convex to plane. Its surface is slightly viscid when moist. The whitish universal veil will entirely cover the youngest mushrooms, form whitish spots or warts on mature mushrooms, and may eventually wash or wear off with age. The Stalk is 5-13 cm (2-5"), usually smooth above the ring and sometimes scaly below. It is .5-2 cm (1/8 - 1") in diameter at the base, narrowing slightly towards the cap. The stalk is dry white or tinged yellowish. The Universal Veil which causes the whitish spots on the cap is cottony, white and usually form a collarlike volva (free rim) at the top of the basal bulb though sometimes forming a thin sheath instead. A Partial Veil is usually present (not in var. exannulata), membranous, white; forming a fragile, superior to median, skirtlike ring on stalk, or disappearing. Gills are free to slightly attached, crowded, broad to narrow, and white. Spore Print is white. Spores are 8-13 x 6-9 microns, elliptical, smooth, and nonamyloid. On the ground, under conifers, particularly Doublas fir. Solitary, scattered or in groups in woods or along forested paths and roads. Coastal California they occur in mixed woods and under live oak shortly after the first fall rains. Rocky Mountains to the West Coast; Rare in East. June; September - October; November - February in California. Pacific Northwest, Spring, Summer and Fall. Can be distinguished from a typical A. pantherina by its yellow to creamy cap and more modest size.